According to Phil Passen, that is all you need to know about him.Actually, Phil was born in 1947, and one thing he does know is how to play the hammered dulcimer, which he never heard of growing up in Monroe, Michigan; Toledo, Ohio; and Ashtabula, Ohio.He probably never heard of the dulcimer while participating actively in the antiwar, civil rights, and women’s liberation movements in Cleveland, Los Angeles, Boston, and Chicago in the sixties and seventies. But the folk music all around him in those days entered his spirit and never left. After Phil and his wife, writer Barbara Gregorich, settled in the Chicago area in the early seventies, they joined the Old Town School of Folk Music, and Phil began to itch to play an instrument. He really wanted to play the drums, but the set he had in mind didn’t fit into a nine hundred square foot apartment. Although Phil heard the hammered dulcimer for the first time on John McCutcheon recordings in the late seventies, he didn’t immediately make the connection between hammering strings and hammering drum heads. Finally, at a John McCutcheon concert at the Old Town School in 1994, the light dawned. Inspired anew as John played the dulcimer, Phil thought: “I can do that.” After just one lesson with teacher Dona Benkert, Phil was hooked. Promises, Promises, published in the summer 1995 issue of Dulcimer Players News, tells the story of Phil’s early (and continuing) dedication to the dulcimer. In 1996 Phil left his work in the graphic arts industry to devote his time to the dulcimer. Today Phil is one of few musicians not only to play the hammered dulcimer, but also to sing while accompanying himself on the instrument. His newest CD, Tramp, Tramp, Tramp: The Music of the Civil War on Hammered Dulcimer showcases his skills while following the progression of the war with a fascinating collection of moving and rousing music. His first two CDs, Swinging on a Gate: Traditional American and Celtic Music and Cold Frosty Morning: Christmas and Winter Holiday Music, both with guitarist Tom Conway, are still very popular. He performs frequently in the greater Chicago area and teaches individual students and at workshops and music festivals. One of his favorite musical activities is getting together with friends for weekly old-time jams. 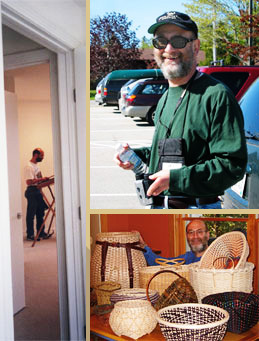 Not content to weave only melodies, Phil has taken up basket weaving and chair caning. He is a member of the National Basketry Organization, as well as the American Federation of Musicians Chicago Local 10-208, the North American Folk Music and Dance Alliance, the Recording Academy, the Old Town School Of Folk Music, and is, he claims, the only 10,000-year-old member of AARP.